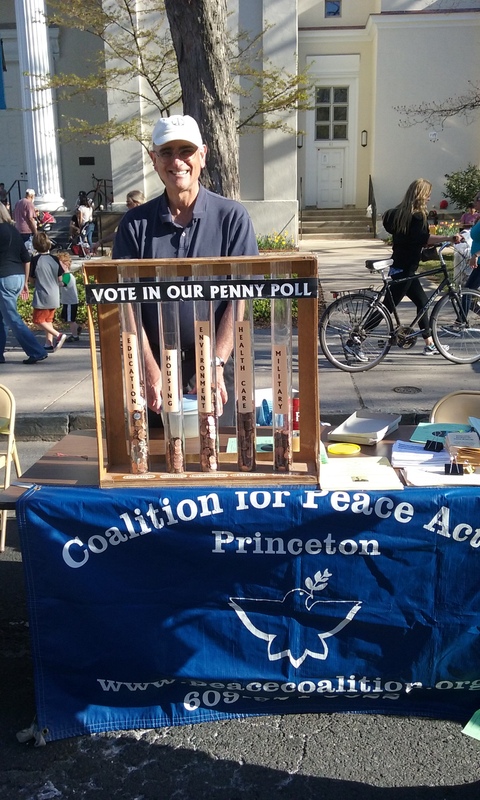 The Princeton-based Coalition for Peace Action (CFPA) today announced the results of its “Penny Poll” conducted at the CFPA table at Communiversity festival in Princeton on April 17. Below are the results of how area residents would like to see their federal tax dollars spent. As people came to the CFPA table at Communiversity, they were invited to express their opinion on how they would like their federal tax dollar to be spent. Each of the 317 participants were given ten pennies and asked to distribute them between five tubes representing categories of federal spending: education, environment, health care, housing, and military. The results are below. Participants were then handed a fact sheet showing that 54% of the “Discretionary Budget” for FY2015 was for military spending. Discretionary spending is what Congress can allocate for what it chooses each year, as distinct from entitlements. Discretionary Budget Funding for Education was just 6%, Health Care 5%; Environment 3%, and Housing 5%. Click Here to see the fact sheet of the Discretionary Budget for FY2015. “This year’s results remain consistent with Penny Poll results from previous years. Taxpayers want more of their hard-earned tax dollars going to education, environment, and health care, and far less to military purposes. We encourage taxpayers to contact their US Representative and Senators via the Capitol Switchboard (202) 224-3121 to urge them to support more peaceful federal budget priorities,” said the Rev. Robert Moore, Executive Director of CFPA.